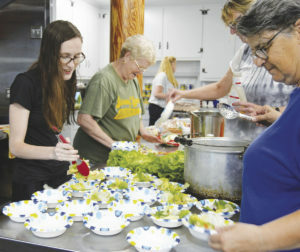 The Dwelling Place is a collaboration of area churches that prepares and serves meals at the United Methodist Church in Woburn for individuals and families in need. Our church is responsible for preparing and serving the meal on the third Saturday of each month. Serving time is only 2 hours — from 5-7 PM. To sign up, contact Louise Ritenhouse, Cindy Mahoney, and Lisa Loughlin, your new Dwelling Place coordinators. The coordinator works with the volunteers to divide up the food preparation responsibilities. 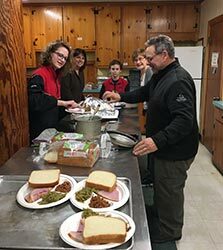 Volunteers at The Dwelling Place usually buy the food and prepare it, then bring it to The Dwelling Place and serve it. 2 cooked spiral hams (7-9 lbs. each),with meat removed from the bone after heating, so it’s ready to serve.